How do you clean your feet? You bend…stretch…and you can’t reach! Keeping your tired feet looking young is such a chore! But not any more! This is Easy Feet..a revolution in convenience…A foot massage every day!Easy Feet has over 1000 rejuvenating bristles to gently massage and clean the top and the bottom of your foot. It even has a built-in pumice stone for rough, cracked heels that makes ugly, dry skin a thing of the past. 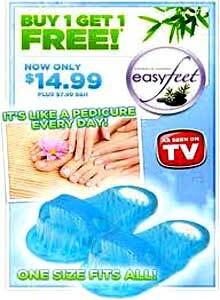 Easy Feet will literally change the way you bathe forever. The unique design not only cleans your feet, but massages and gently exfoliates and eliminates dirt. And, most importantly, Easy Feet cleans in between your toes! The security feature of Easy Feet is the suction soles that allows it to be secure for kids, older adults, and even senior citizens. Soaping up your feet on an already wet surface is definitely an accident that is waiting to happen, and for young ones, seniors, or moms that are pregnant, just a single fall could possibly be dangerous. But because Easy Feet has a grip, you’ll in no way slip. They are just the items for improved back health too. Furthermore you’ll keep spotless hygienic feet even when you’ve been the beach, at the gymnasium, or in the locker room. Stop doing that one-legged dance in that bath tub and stop ignoring your feet. Clean and massage your feet from heel to toe. Easy Feet is great for feet of all ages. Adults and children alike can benefit from cleaner, healthier feet. Its like pedicure for your feet. Easy Feet does the hard work while you merely rest. With more than 1,000 bristles located on both top and bottom, Easy Feet sandals cleanses the feet from the heel to the toes, top and bottom. What I do like about the product is that it is a great way to actually wash your feet. Forget about the massage action mentioned in the ad. It certainly does feel good but it is far from an excellent massage. I think the real value in this scrubber is the fact that you do not have to bend over to wash your feet by hand.